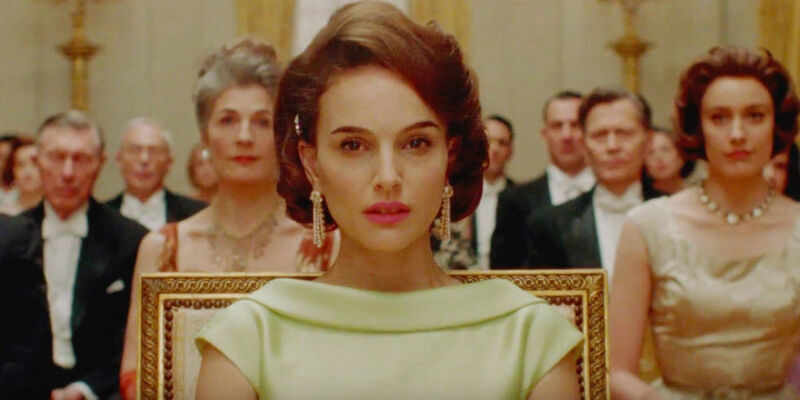 Some may walk away from the Pablo Larrain’s glorious Jackie believing that Natalie Portman’s portrayal of Jackie Kennedy verges on the line of imitation, but maybe that’s the point. Jackie Kennedy was very much an actress of her own right, constructing an East Coast accent and royal facade. When she witnessed her husband getting assassinated in Dallas in 1963, she still had to keep up that look for the American people. They saw a distraught first lady, but they never saw a wife mourning for her husband who was killed on her lap. Larrain’s first English feature, Jackie, explores Jackie Kennedy’s (Natalie Portman) grief leading up to her John F Kennedy’s funeral. Instead of being a traditional biopic, it’s centered around a famous interview between her and a trusted journalist one week after JFK’s death. We barely see the assassination take place (besides a graphic glimpse of the brain matter), but instead the camera focuses on Jackie’s face. Larrain always keep Portman in the center of the screen and shines light on her facial features. It’s a very intimate character study that shows this woman, who is known for her poise, break down like any other human being. Larrain keeps the female gaze strong by always showing what Jackie is thinking in every situation. When Jackie is wiping the blood off her face minutes after the assassination, the camera keeps on her face for one straight minute, watching her tears drop and mix with her husband’s blood. But because this is a psychological study on one character, it neglects the other characters in the room. Billy Crudup, Greta Gerwig, and Peter Sarsgaard put on convincing performances but were not very memorable in the film; they felt more like white noise that eventually faded into the background. This is fine for most of the film, but it would have been nice to see some of Jackie’s interactions fleshed out more. This is Portman’s best performance since her Academy Award winning role in Black Swan. This will surely land her another nomination, and possibly the win. Her portrayal of Jackie Kennedy showed the graceful First Lady as a woman who just lost her husband in the worst way possible. At the end of the film, there is a scene where Jackie is sees truck drivers taking out mannequins for a boutique display. It’s an obvious metaphor for being attractive to the world, but it fits in this film. Jackie Kennedy never shows her grief to the American public; She tries hard to retain her image and never show her emotions. Larrain does a great job of showing that restraint and not making a mockery out of it. Next ArticleTV Review: Scream Queens 2x08 ""Rapunzel, Rapunzel"